Black switches and buttons factory soldered ready to install. 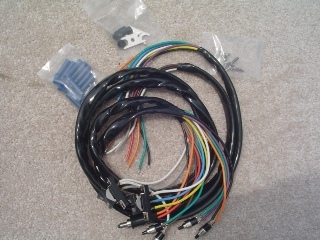 This 48 inch handlebar wiring harness has enough wire to accommodate the tallest apehangers. Comes with all the wire connectors, buttons, screws, brake switch boot, switch plate retainers and is color coded to match the original equipment wiring.